Synopsis: Humanity finds a mysterious, obviously artificial object buried beneath the Lunar surface and, with the intelligent computer HAL 9000, sets off on a quest. Review: Hello and welcome to another episode of Confessions of an Embarrassed Movie Fan. 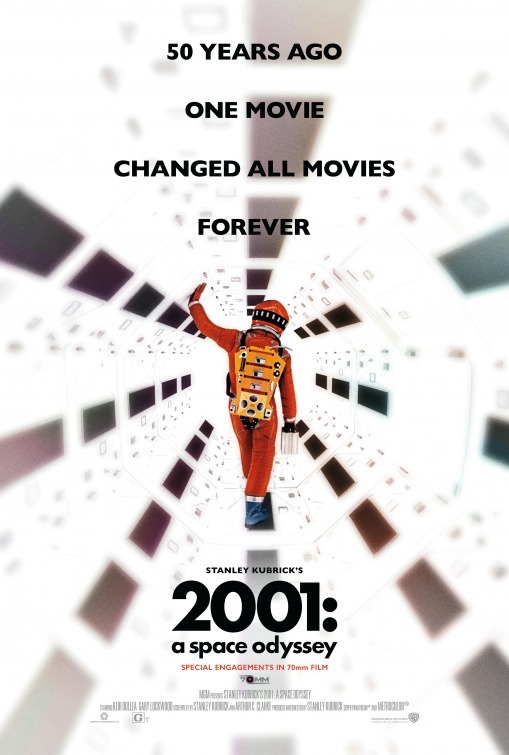 Today’s episode will briefly cover my red-faced shame in admitting that before catching Stanley Kubrick’s 2001: A Space Odyssey projected in glorious IMAX I had never seen the film all the way through. Yes, it’s true. Though not for lack of trying, up until yesterday my efforts in taking in this masterpiece where thwarted by distraction, sleep deprivation, and, gulp, a little boredom. The Blu-Ray has played from start to finish in my house a grand total of 3 times and each time I fell asleep. I think it was because before I was seeing it out of necessity rather than true interest so it failed to capture my attention or keep me awake. I had no trouble staying awake, however, seeing the film during its one-week engagement in IMAX at the Minnesota Zoo. For the first time I was able to sit back and truly take in the beauty and wonder of Kubrick’s grand epic and be totally enveloped in the dazzle of it all. For a film celebrating its 50th birthday, it has lost none of the grandeur and awe it inspired when it was first released. Sitting here now in the midst of seeing one CGI-fest after another, it’s truly an amazement to recognize the magnitude of the work that went into 2001: A Space Odyssey and marvel at the countless movies, actors, directors, and effects technicians it has inspired in the years since it was first released. To explain a summary of the movie in full would be to oversimplify things because the plot is very clearly secondary to the portals of self-interpretation opened up to us by Kubrick and writer Arthur C. Clarke. Clarke’s short story provided the genesis of the project, which, after Kubrick’s ambiguous movie came out, he spent the next years trying to explain in greater detail. Kubrick was ok with leaving the film (especially its divisive ending) open to interpretation and so am I. There’s a refreshing sentiment in a filmmaker trusting the audience enough to let them make up their own minds. By the time the film ends we’ve been on such a journey that it feels right for Kubrick to hand it back to us and let us discover what it all means to us. The connective tissue of the movie surrounds a mysterious black monolith. Appearing first in a 20-minute dialogue-free opening segment following primates in the Africa desert millions of year ago, the presence of the monolith seems to grant the great apes knowledge that helps them advance in evolution with the use of tools. That leads us to the next segment several million years later when the monolith is discovered buried on the moon. When the monolith is first exposed to the sun it seems to send a signal through the universe directed at the planet Jupiter and that’s when the most familiar elements of the plot take hold. The Jupiter mission, led by Dave (Keir Dullea) and Frank (Gary Lockwood), is on its way through the stars to the far off planet when they run afoul of HAL 9000, the sentient computer that oversees the operations of their ship and their life support. At 149 minutes (not including a 20-minute intermission 90 minutes in), the film is a commitment to get through but it does fly by. Even numerous prolonged sequences set to classical music, mostly involving spacecraft landing places with grand majesty, don’t feel overindulgent or repetitive. It’s the incredible visuals from cinematographer Geoffrey Unsworth aided by Kubrick’s Oscar-winning way-ahead-of-their-time visual effects that give the film its sheer size. There are several camera shots done practically that you’ll be scratching your head wondering how they achieved such a feat. An extended light sequence near the end as our hero passes through time and space might test your visual and aural limits but its best to just grip your seat (or your companion) and take it all in. Kubrick is attuned to every element of what is coming off the screen. There’s silence when necessary, exposition only when required, and large sequences without dialogue that are presented visually in such a way that we are able to narrate for ourselves almost subconsciously. The film is massive in cinematic size, emotional scope, and cognitive scale and is easily the most recommended on the biggest screen you can find. For one week you can catch this in IMAX theaters near you and if you’ve never seen the film, never made it through without falling asleep (apologies again, Mr. Kubrick! ), or haven’t seen it in years, now is your chance to check another classic off your list in the most deluxe way possible.